Can you guess what is the meaning of this picture? Hint: It happens in Gaza. And it is part of a network that Hamas has been managing, quite lucratively and preferentially, to allow smuggling of anything – from weapons to lambs – with strict controls, and fees. It is depressing to see that the closure forces people to smuggle the lambs and other core needs. On the other side, it is scary to think what else is rampantly brought in through these hundreds of tunnels. Hamas is receiving a steady revenue licensing illicit tunnels in Gaza’s south to smugglers and business people who are importing fuel and other items from Egypt to meet shortages created by Israel’s blockade of the Palestinian territory. Hundreds of tents covering entrances to tunnels – big enough to transport through everything from cows to industrial-size air-conditioners – have mushroomed along Gaza’s border with Egypt. Many tunnels are also rigged with plastic pipes, siphoning Egypt’s heavily subsidised fuel into Gaza where drivers have had to resort to running their cars on cooking oil because Israel cut petrol, diesel and gas supplies to a bare minimum. One fuel station operator, who did not want to be named, said that in the first 19 days of October he imported 313,000 litres (68,860 gallons) of diesel and 161,500 litres of petrol through the tunnels. "Every day I send my truck to [the border town of] Rafah," he said, adding that he was earning 3.5 shekels (55p) on every litre of Egyptian fuel compared with half a shekel on same amount of Israeli fuel. Israel imposed the blockade to weaken Hamas’s control of Gaza after the Islamist group ousted their more secular rival, Fatah, 15 months ago. While the siege has brought the territory’s economy to a halt, it has done little to weaken Hamas, which has cashed in on the tunnels’ business. Smuggling has become a lucrative and entrenched part of the economy. Omar Shaban, a Gaza economist, estimates that smuggling comprises about 90% of market activity in the territory and is worth around $30m (£18m) to $40m a month. He said: "The tunnels are integrated into the economy. We have a new economic structure now, a new business community." One owner, whose tunnel lies within 200 metres of an Egyptian watchtower, operates 24-hours a day, importing "everything you can imagine". Last month, Hamas began charging tunnel owners a 10,000-shekel annual licence fee. Most tunnels are located in Rafah, and its mayor, Issa al-Nashar, said there are now about 400 of them. Other sources, however, estimate the number is closer to 600 – and that the fees comprise 20% of the Rafah municipality’s revenue. Nashar said the tunnel owners make $10,000 a day and that he wanted to charge much more. "But we had a discussion with some of the tunnel owners and we agreed on 10,000 shekels," he said. 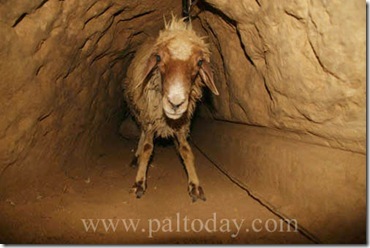 Hamas security forces patrol the tunnels, while the municipality has set up a committee to collect the fees. Rafah also requires the owners to pay 1,000 shekels for electricity and is now pressurising them to sign contracts promising to pay up to $40,000 to the families of tunnel workers killed on the job. Forty people have died working in the sandy, unreinforced underground passages so far this year. In a siege-distorted economy – with an estimated 20% inflation rate, 98% of industry forced to close and unemployment at 45% in the first six months of 2008 – the majority of ordinary Palestinians are yet to benefit. Abu Wajdi is one of around 6,000 workers who have flocked to Rafah in search of a job. He is paid only 900 shekels a month, but says he is risking his life because he is a "patriot". "We are participating in lifting the siege. We are trying to fill the market to meet the needs of our people," he said. RAFAH, Gaza Strip (Reuters) – When the calves were hauled out of the tunnel from Egypt on Tuesday, they could hardly stand up. After a terrifying, 1000 meter (yard) underground trip into the Israeli-blockaded Gaza Strip, what the young cattle wanted most was a long drink of cool water. 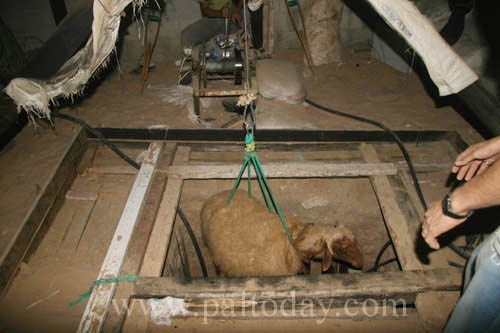 Underground livestock smuggling has increased dramatically ahead of Eid Al-Adha, the day of sacrifice due December 10, when Muslims the world over slaughter animals and feed the poor to seek God’s forgiveness. 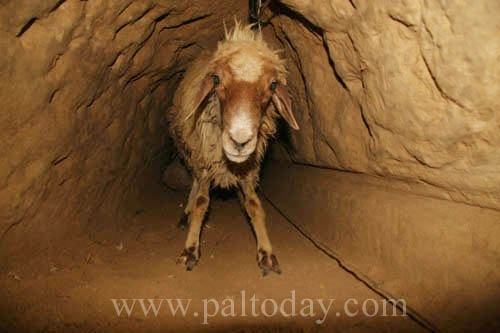 "Even if we brought in animals every day we would not meet the demand for the Eid," said a tunnel operator who identified himself as Abu Luqaib. Hundreds of Gaza merchants throng around the border area of Rafah every day to pick up merchandise coming to Gaza from Egypt via subterranean passages that have created a flourishing trade zone. "It’s an industrial zone here," said the 23-year-old tunnel operator as his crew pulled a bawling calf up the deep shaft by a simple rope around its middle. 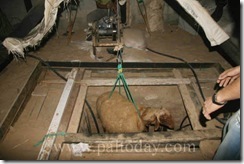 No livestock harness was used. Gaza has suffered galloping unemployment since Israel tightened its blockade on the territory in 2007 to try to weaken its Palestinian rulers, Hamas, an Islamist group sworn to the destruction of the Jewish state. Goods are scarce in Gaza markets because of Israeli restrictions on what Gaza may and may not import. The tunnel network handles all sorts of readily portable merchandise including fuel, automobile parts, computers and clothes. The number of tunnels has mushroomed in the past year to around 800, according to Abu Luqaib. They employ between 20,000 to 25,000 workers in a gray economy struggling for survival. A standard 500 meter tunnel costs $60,000 to $90,000 to build, he says. A 1,000 tunnel built with extra safety features can cost up to $150,000. The tunnels can be dangerous. Palestinian officials say at least 45 Gazans have died in cave-ins this year, some of which were blamed by Hamas on the security forces in Egypt, who are under pressure from Israel and the United States to clamp down. But such risks are clearly outweighed by potential profits. The calves that came through on Tuesday cost $350 each plus $250 for the transport, a total of $600 per head. Hamas, which seized control of Gaza in 2007 from the secular Fatah movement of Palestinian President Mahmoud Abbas, endorses the tunnels as a way of defying the blockade, and, according to some Gaza residents, imposes taxes on the tunnel trade. It also keeps a close eye on what comes through. "No one can smuggle arms or drugs, on the orders of Hamas," said Abu Luqaib. 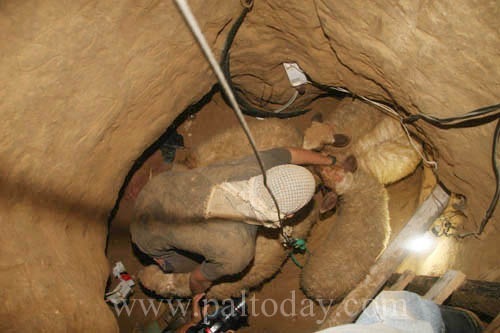 Israel, however, says Hamas runs its own tunnel network to bring arms, explosives and ammunition. The tunnels also ferry people who cannot otherwise leave or enter Gaza unless they have Israeli or Egyptian permission. One Gaza woman, Umm Khaled, had been stuck in Egypt for several weeks while her husband fretted over telling her the unwelcome news that her only way home was via a dark tunnel. So friends slipped a sleeping draught into her glass of juice, wrapped her in a blanket and laid her in an underground trolley to be whisked through to the beleaguered Gaza Strip. "She got the fastest, most tranquil, and safest trip home in the end," said tunnel operator Ahmed, who gave no second name.